Retired professional wrestler (of no great fame, but some notoriety), Lucas Winter, runs out of gas on his way back from a personal appearance and finds himself in a very small, very insular town. He gets taken advantage of by a local gas station owner/mechanic, leaving him stranded for a day in a town that seems untouched by the outside world (or maybe that's just because Winter can't get even get one bar on his cell phone). One apparently common problem for a professional wrestler, are small town tough guys wanting to pick a fight with you -- to prove that you're not that tough, or that they really are. Winter finds himself on the business end of one of those altercations, and defends himself well. So well, that he's kicked out of the only dining establishment in town -- even before he can finish his breakfast. It's not long before the entire Sheriff's Department (all 3 deputies and the Sheriff himself) come to take Winter into custody. The man he fought with is dead, and there aren't a whole lot of suspects.Winter finds himself embroiled in small town politics, a frame job that's both sloppy and seemingly inescapable -- in between the Scylla of impotent cops and the Charybdis a powerful and rich family. He needs to rely on his wits, his charm and a whole lotta luck to clear his name and maybe, just maybe, get out of Anaconda alive. I wasn't that crazy about many of the characters -- well, actually, just the various family members of the dead man, at least one of them could've used a little more depth. The various other townspeople were great, both the people who were around for a page or two or the Law Enforcement types who were with Winter throughout the book. Lucas Winter himself was a fun protagonist, he's just funny enough to entertain without turning this into a comedy, and human enough to keep this from being a Jack Reacher clone. This is a very familiar story, really. But Stansfield puts a couple of very interesting twists on it -- I won't tell you most of them, because that'd spoil the fun. One that I've already mentioned is our protagonist's former life -- a middling former Pro Wrestler? That right there is a stroke of genius. He can take some physical punishment -- but not a Herculean amount. He can dish out the physical punishment -- but not in a Jack Reacher/Evan Smoak way. He's tenacious, he's tough, and best of all, he's desperate. One teeny-tiny little gripe -- if you're going to write about an American in the middle of the US, don't talk about kilometers out of town. Manatee Books is a British publisher, so we Yanks can forgive a "tyre" or two, or using "mobile" instead of "cell" -- put come on, get lose the kilometers, please. The book doesn't hold a lot of surprises -- but the ones that it does hold? Wow -- I'm pretty sure I yelled at one point. The rest is told by someone very assured and quite skilled at his craft. I've said it before, I'll say it again: A familiar tune sung well is just as entertaining to listen to as a new song -- same applies to stories. You tell me a story like one I've heard before in a way that I an appreciate, I'll still like it today as much as I did the first time. A thriller that'll press all the right buttons, will throw a shock or two at you, and keep you riveted throughout it's very fast pace -- sounds like a pretty good read to me. 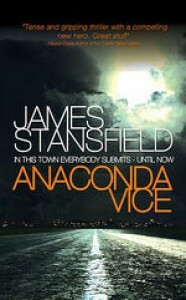 Check Stansfield and Anaconda Vice out.